Here is some bad news for the BJP which is trying to wrest the Chandigarh parliamentary seat from the Congress in the next month’s election. The Union Minister of State for Home Affairs, Mr ID Swami, said there was a possibility of mid-term poll to the state Assembly in Haryana keeping in view the prevailing political developments in the state. He said this while addressing a series of nukkar sabhas in the city today. Kumari Selja of the Congress today kick-started her election campaign in the Ambala parliamentary constituency. A rousing welcome was given by Congress activists when Kumari Selja arrived at Mohra from Delhi this morning. It was “feel best” for the Haryana Congress when the Lok Sabha elections were announced. But its lackadaisical approach and inordinate delay in the selection of candidates has left the party with “feeling average” in the state. Haryana Congress president Bhajan Lal today firmly denied that he had any plans to join the BJP or he was under any kind of pressure from his supporters to do so. The Congress nominee for the Rohtak Lok Sabha seat and the Leader of the Opposition in the Haryana Assembly, Mr Bhupinder Singh Hooda, today launched the Congress campaign from Meham Chaubisi Chabutra. The Haryana Pardesh Congress Committee president and former Chief Minister Mr Bhajan Lal, today said that the party would announce its candidates for the 10 Lok Sabha seats in Haryana by tomorrow. Students of S.A. Jain Senior Model School perform during the golden jubilee function of their school in Ambala on Sunday. BJP candidate from Sonepat Lok Sabha constituency Kishan Singh Sangwan, who apprehended danger to his life, has been provided ‘Z-plus’ security by the Home Ministry, official sources said here today. The Ambala police arrested a dreaded Babbar Khalsa International terrorist last night. Harjit Singh, alias Kala, and his accomplice Richpal Kaur were arrested from near the Tangri river after an encounter with the police. YAMUNANAGAR: Due to mismanagement of Haryana Power Generation Corporation Limited, the power position in Haryana has worsened. According to highly placed sources the Power House No 4 of Hydel Project was to be completed by March 25, 2004, but till date the goal has not been achieved by the department. A woman, Raj, of Mangala village in the district has lodged a complaint with the police accusing her second husband of beating her 7-year-old handicapped daughter to death. On the basis of the complaint the police dug out the body of the child. A post-mortem was performed, which confirmed death due to a blow on the head. Martyr Mehar Singh of 33 Rashtriya Rifles was cremated with full state honours at his native village Toprakalan, 10 km from here, today. The Haryana Chief Minister, Mr Om Prakash Chautala, who is also the INLD supremo, has indicated that he along with the SAD chief, Mr Parkash Singh Badal, would soon address a joint poll rally here in support of the INLD candidate and former Union Minister, Mr Harmohan Dhawan. “Mr Badal is busy campaigning for his party in Punjab.”, said Mr Chautala in a chat with TNS here today. “I am trying to get some time from Mr Badal. He would be brought here to address a rally in support of Mr Dhawan at a mutually convenient date”. Mr Chautala said that he would also invite the National Conference leader, Dr Farooq Abdullah, to address a rally in support of the INLD candidate in Chandigarh. Mr Dhawan and his party men have been claiming for quite a while that he was seeking election from the Chandigarh parliamentary constituency on the INLD ticket with the “blessings” of Mr Badal. As a matter of fact, Mr Dhawan had made it clear to Mr Chautala that he would contest the poll only if SAD supported him. Both Mr Chautala and Mr Badal reportedly promised him support at a breakfast meeting held at the residence of the Chief Minister. But the local BJP leadership has been trying to put up a brave front over the development by discounting these reports. Mr Chautala’s announcement today has, therefore, come as a great damper for the UT BJP leadership which has been trying to project that since the Shiromani Akali Dal led by Mr Badal is a partner of the National Democratic Alliance (NDA) ruling at the Centre, SAD was bound to support the BJP nominee, Mr Satya Pal Jain in Chandigarh. Moreover, the BJP and SAD were fighting the poll jointly in the neighbouring Punjab. Therefore, there was no question of SAD supporting any party other than the BJP. The local unit of SAD is a badly divided lot. One faction led by Mr Gurpartap Singh Riar says that it would not support the BJP in the absence of a clear direction from the Akali high command. The other faction maintains that since the SAD was a partner of the NDA at the Centre, no separate direction was required. It has been appealing to the local Sikhs to support the BJP. The SGPC chief, Jathedar Gurcharan Singh Tohra, had visited the BJP’s local office a few days before his death and promised all support to Mr Satya Pal Jain. Mr Tota Singh, another senior Akali leader, held an extended meeting at the residence of Mr Jain a couple of days ago and promised SAD support to Mr Jain. Prosperity, peace and progress are the main issues on which the Indian National Lok Dal (INLD) is fighting the forthcoming Lok Sabha elections, said Mr Abhay Singh Chautala while addressing party workers after inaugurating his election office here today. Mr Chautala said due to his engagements in other constituencies he would not be able to devote much time to his own constituency and had asked the outgoing MPs Ms Kailasho Saini to take charge of the electioneering here. He said “we are following the footsteps of late Jannayak Chaudhry Devi Lal and are taking all steps to increase the generation of power which has already been increased by 828 megawatts. We are also trying to complete the SYL canal so that Haryana could get more water for irrigation”. Mr Chautala said the Congress was responsible for the mess in the country and Ms Sonia Gandhi, being of foreign origin, cannot salvage the party. Commenting about the results of the Lok Sabha elections, he said his party would win 11 seats in Haryana, including that in the state capital Chandigarh. His party candidates would contest from 30 seats in Uttar Pradesh, Rajasthan and two seats in Delhi. Mr Sher Singh Barsami, president, INLD and Ms Kailaso Saini, former MP, Dr Malik Chand Gambhir, MLA from Yamunanagar, Mr Faquir Chand Mullana, MP Rajya Sabha, also spoke on the occasion. The Chief Minister of Haryana, Mr Om Prakash Chautala, today lamented the fall in standards in public life. He said the main objective of every leader seemed to be to get into Parliament at any cost. Speaking at a rally held at the residence of Mr Harmohan Dhawan in support of the INLD candidate, Mr Chautala said he was glad to see a large number of Muslims at the meeting. He assured them that the party would stand by them. Earlier, Mr Dhawan, Mr Sandeep Singh, Mr Israr Ahmed and Mr Mohammad Salim Khan were among those who spoke. A former Haryana minister, Mr Narender Sharma, along with his 43 supporters and the Lok Jan Shakti Party, national general secretary and Haryana Bahujan Samaj Party (HBSP), former state president, Mr Ashok Sherwal, HBSP, former state general secretary, Mr Vikas Gupta, HBSP Volunteer Force, state president, Mr Dinesh Malik with their supporters joined the Indian National Lok Dal party, in the presence of former MP, Mr Abhey Singh Chautala, at a press conference held at Parakeet, 5 km from here, today. Announcing this, the INLD, state president, Mr Sher Singh Badshami said “with powers inherited in me as INLD state president and after getting the approval of the INLD supremo and Haryana Chief Minister, Mr Om Prakash Chautala, I declare their joining in the party. The newly joined persons will be fully respected in the party and would be assigned due responsibilities shortly”, Mr Badshami added. Addressing newspersons, Mr Narender Sharma, who had fought elections from the Pundri Vidhan Sabha constituency twice as an individual candidate, said he had joined the INLD, because he had full faith and confidence in the INLD ideologies. But on the other hand, Mr Ashok Sherwal said he had left the HBSP due to its leaders’ dictatorial attitude towards the party workers. Mr Abhey Singh Chautala, who is contesting the Lok Sabha election from the Kurukshetra constituency reached Pipli today after campaigning in two Vidhan Sabha constituencies of the Kurukshetra Lok Sabha constituency — Yamunanagar and Radaur, said the people had assured him their vote and support. They had asked him to continue his election campaign in other parts of Haryana after filing the nomination papers. “Therefore, I have full faith in people who will elect me from this constituency”, Mr Chautala asserted. When a journalist asked Mr Chautala why former MP, Mrs Kailasho Saini, who had won the last Lok Sabha election from the Kurukshetra constituency and had won, was not given the ticket this time, Mr Chautala said Mrs Saini was already attached with the INLD and every party worker had its own importance in the party set up. Coming down heavily on the Congress, the BJP and the Haryana Vikas Party (HVP), Mr Chautala said these parties were having dearth of strong candidates and that was why they had failed in declaring their respective candidates in the 10 Lok Sabha constituencies in Haryana so far. Without naming the candidates, Mr Chautala claimed that although, strong candidates from the Congress and the BJP were in his permanent contact and if he intended, he could bring them to the INLD and thus, the INLD could be made stronger, yet he would not do so because it would be against the INLD policies. Moreover, the then Deputy Prime Minister of India, Mr Devi Lal had succeeded in banning the Aaya Ram-Gaya Ram, the defecting of the candidates from one party to the other. Thus, following his footprints the INLD would neither allow nor implement the defection of the candidates. The former MP, Mrs Kailasho Saini, Improvement Trust, Thanesar, Chairman, Mr O.P. Khurana, INLD district President, Mr Maya Ram and INLD, Halqa Thanesar, President, Mr Mewa Singh were among those, who were present at the function. Mr Swami mainly focussed on Prime Minister Atal Bihari Vajpayee’s leadership qualities seeking votes in latter’s name. However, he scoffed at Congress leader Bhajan Lal, whom he defeated in the last elections from here, on the issue of atrocities committed against the Sikh community during his tenure as the Chief Minister of Haryana. He promised that the remaining development works initiated by him in the constituency would soon be completed. “There has been a delay in initiating construction work on certain projects due to the non-availability of funds from the state government’s share”, he alleged. Former Industry Minister of Haryana, Mr Shashi Pal Mehta, said the INLD, the Congress and the HVP would be rooted out from the state in these elections. It was only with the support of the BJP that the INLD managed to get five Lok Sabha seats in the state in the last elections, he said. Mr Swami addressed nukkar sabhas in Sector-13, 14, Ashoka Colony and many other areas of the city before noon. Kumari Selja of the Congress today kick-started her election campaign in the Ambala parliamentary constituency. A rousing welcome was given by Congress activists when Kumari Selja arrived at Mohra from Delhi this morning. She began her campaigning even though a formal announcement of her candidature is awaited. She told mediapersons that she had been informally told about her candidature from Ambala. “I was hoping that the list of candidates would be announced by today, so a few days ago, I had set my programme. I did not think it appropriate to change the programme,” she said. She said the reception accorded to her was an indicator of the support she enjoyed. “I am getting the support of people. I have never hesitated to work hard for the people and if given an opportunity, I will serve the people,” she said. “I am determined to solve problems being faced by the people,” she added. 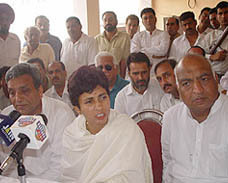 Kumari Selja said she did not choose Ambala to contest the elections. “The decision was taken by the party high command after representations from several Congress leaders that I should contest the Ambala seat,” she said. She said last time she did not contest the Lok Sabha elections since the party needed her services elsewhere. “I was asked to work at Bellary, so I did not contest,” she said. She said there were no differences among Congressmen in the state. She said she would request Congress President Sonia Gandhi to address a public rally in Ambala. “The BJP and its allies do not have concrete issues and rake up issues like Bofors and Ram temple during the elections. During my campaign, I will lay stress on local as well as national issues,” she said. While the candidates of the Haryana Vikas Party (HVP) and the Indian National Lok Dal (INLD) are about to complete the first round of campaigning in most of the 10 Lok Sabha seats, the Congress is yet to announce its candidates officially. It is true that the HVP and the INLD also announced the final lists of their candidates late, but these parties had nominated their candidates for all but a couple of seats well in time. The BJP too renominated its five sitting MPs well in time, while it is waiting for the Congress list before selecting its candidates for the remaining five seats. But then the BJP was never in reckoning on these five seats like the Congress once was. Though the Congress has finalised its candidates for five constituencies, officially it is still to declare their names. For the remaining five seats search is still continuing. For the Congress woes, both the state leaders and the party high command are guilty. The state leaders have put their personal ambitions above the party interest. Instead of putting its feet down firmly, the high command has virtually encouraged the state leaders and their cronies to blackmail it. Prospective candidates as well as their supporters are losing the enthusiasm necessary to contest the elections. The time they would have used for campaigning, they have spent in camping in Delhi to lobby for the ticket. The infighting among the state leaders is costing the party the goodwill of the people it could have encashed in view of the strong anti-incumbency sentiments in the state. Popular perception is growing that the Congress is a party at war, not with the INLD or the BJP, but with itself. This will naturally push the anti-Chautala voters towards either the BJP or the HVP. By fielding his younger son, Abhay Singh from Kurukshetra, and the Transport Minister, Mr Ashok Arora, from Karnal, the INLD chief, Mr Om Prakash Chautala, has added to the Congress woes. The party has to rethink its strategy for these seats at a time when it was unable to devise the original strategy. From Kurukshetra, earlier the party was thinking of fielding either Mr Naveen Jindal, son of the industrialist-turned-politician, Mr O.P. Jindal, or Mr Tara Singh, former MP. Now the names of Mr Randeep Singh Surjewala, president of the All-India Youth Congress, and Mr Jai Prakash Barwala, party MLA from Barwala, have been added to the list of probable candidates. Party sources say the AICC President, Mrs Sonia Gandhi, has told her deputies that Mr Surjewala would contest from the seat of his choice. He is interested in Hisar, of which the traditional assembly seat of the Surjewalas, Narwana, is a part. Many in the field believe that Mr Jai Prakash, former chief of the infamous Green Brigade of the Janata Dal, will match Mr Abhay Singh. The sources say a senior Haryana Congress leader tried very hard to persuade Mr Surjewala to contest from Kurukshetra. Mr Sujewala is believed to have told him that since he had contested against the elder Chautala thrice, he was not afraid to take on the younger Chautala. The others too should get a chance to fight the Chautalas, he is reported to have told the high command. A leading hotelier of Chandigarh and former Union minister, Mr Venod Sharma, has emerged as a strong contender for the Congress ticket for the Karnal seat. Mr Sharma is a person who is a friend of the top three in the Haryana Congress — Mr Bhajan Lal, Mr Bhupinder Singh Hooda and Mr Birender Singh. The sources say when his name cropped up, no one had any objection. Party men are now praying that the high command is able to decide the candidates before April 16 when the nominations for the Lok Sabha elections in Haryana will open. In a statement issued here, Mr Bhajan Lal said a news report published in a section of the press suggesting that he was under pressure from his supporters to quit the Congress and join the BJP in case the former did not nominate the candidates recommended by him was “baseless and planted to tarnish my image”. Mr Bhajan Lal said: “Jalte kole ko to chimte se pakadte hain. Main to BJP ko chimte se bhi naan pakdoon. Is main shamil hona to bahut door ki baat hai (a burning coal is held by a pair of tongs. I would not touch the BJP even with tongs, what to talk of joining it)”. He said the news had been published at a time when his younger son, Mr Kuldeep Bishnoi, was seeking votes in the Bhiwani Lok Sabha constituency to strengthen the hands of Mrs Sonia Gandhi. He said since he was heading the party in the state, it would be his endeavour to ensure the victory of the Congress in all the 10 Lok Sabha constituencies, irrespective of the fact whom the party nominated to contest the elections. Three-time MLA and former minister Lachhman Singh sent a fax message to Mrs Gandhi urging her to order a probe to find out the source of the news report so that action could be taken against such a person, whatever position he might be holding in the Congress. Mr Lachhman Singh is a close associate of Mr Bhajan Lal. Mr Hooda who was presented a specially fabricated vehicle christened as ‘Vikalp Rath’ on the occasion by his supporters vowed to end Om Parkash Chautala’s rule in the state saying “the rath will now stop only after Chautala was thrown out”. He said the real significance of the coming elections lay in the fact that the outcome would decide the future of Haryana. In an apparent reference to the Chautala family he said the political power now being monopolised by “bagris” had to be brought to Rohtak which despite being the kingmaker had been denied its due so far. The Congress leader said Haryana needed a change of political culture and the need of the hour was to end corruption, restore law and order and pay attention to education and development. This, he said, could only be done if the Congress was voted to power in Haryana. Targeting the BJP, he said it planned to hand over political power to 20 richest families in the country. The BJP could never be the party of the common man since it did not represent the poor and the farmers. He asked people not to repeat the same mistake that they committed in the last elections after being carried away by the Kargil war. Mr Hooda plans to tour the entire state on his specially fabricated rath after spending three days in his own constituency. The Haryana Pardesh Congress Committee (HPCC) president and former Chief Minister Mr Bhajan Lal, today said that the party would announce its candidates for the 10 Lok Sabha seats in Haryana by tomorrow. He was talking to newsmen after inaugurating the election office of his son Mr Kuldeep Bishnoi, Congress candidate from Bhiwani, at the Balsmand road here. He said the party had finanlised the list of candidates for all 10 seats and the names would be declared tomorrow after getting the approval from the All India Congress Committee (AICC) President, Ms Sonia Gandhi. However, he refused to divulge the names of party candidates. He said there was no delay in declaring party candidates from Haryana. He said though other parties had announced their candidates but there was still enough time for campaigning as the polling in the state was scheduled for May 10. Commenting on rumours of quitting the Congress if his loyalists were not given the party ticket, Mr Bhajan Lal said there was no question of his joining the Bharatiya Janata Party. He said he would like to retire from politics instead of joining the BJP. The party legislator and contender for party ticket from the Hisar parliamentary seat Mr Jai Parkash, would also not quit the party, he added. He refused to comment on Ms Geeta Grewal’s decision of contesting the election from Rohtak against her father-in-law. Mr Bhupinder Singh Hooda, Leader of the opposition and senior Congress leader, saying that it was internal matter of their family. Mr Sangwan, who apprehended danger to his life on account of “rivalry and enmity” with Haryana Chief Minister Om Prakash Chautala and state DGP M.S. Malik, whose wife is contesting from the constituency on INLD ticket, has been provided a 15-man security. Six of the security men would accompany him round-the-clock, the sources said. The security has been provided on Mr Sangwan’s request, the sources said adding that the BJP candidate had also urged the Union Home Ministry to entrust the security to the CRPF instead of the Haryana Police for safeguarding his life and other member of the family. Talking to mediapersons here today, Superintendent of Police Mohammad Akil said a team of the CIA staff, led by Inspector Hari Singh, was on duty near the main bus stand of Ambala Cantonment when it received a tip-off about terrorist Harjit Singh riding a motor cycle near the Tangri river. “Harjit Singh is wanted in a number of cases and the Haryana police as well as the Punjab police were on the lookout for him,” he said. Mr Akil said the police team set up a naka near Sarsehri village as Harjit Singh was planning to enter Punjab from there. “The police team spotted a motor cycle without a number-plate. Harjit Singh was riding the motor cycle while a woman, wearing a red suit, was riding pillion,” he said. He said when the police tried to flag down the motor cycle at the naka, Harjit Singh accelerated the motor cycle and evaded the naka. “The next naka on the road was alerted and directed to stop the motor cycle while the team gave a chase to the terrorist,” he said. The SP said the motorcyclist lost control and fell. “The woman riding pillion asked Harjit Singh to open fire on the police party. Harjit Singh took out a country-made revolver and fired two shots. The police returned the fire. Thereafter, both Harjit Singh and Richpal Kaur, alias Preet, were arrested,” he said. Mr Akil said they had seized the revolver and 23 cartridges from Harjit Singh while two revolvers and five cartridges had been seized from Richpal Kaur. He said about a month ago, Harjit Singh had a “love marriage” with Richpal Kaur, who was a resident of Khaspur in Patiala. Richpal Kaur was married earlier, but her husband had left her. Cases had been registered against Harjit Singh in Kurali, Sangrur, Ambala City, Gannaur, Banur, Ambala Sadar, Rajpura and Panchkula. In 1995, a case was registered against him in the Raipur Rani police station after the police seized an AK-56 gun and live cartridges from him. He was sent to jail. He was granted parole in 2000, but did not return. In 2001, he was arrested by the Panchkula police. He was then sent to Patiala jail. About five months ago, the police brought him to Ambala for hearing in a case. Harjit Singh hatched a plan to escape with another Patiala jail inmate Krishan. Krishan’s brother Bhupinder and cousin brother Karnail Singh used to meet him in jail. While eating food in Ambala, Karnail Singh mixed drugs with lassi. Police personnel escorting Harjit Singh fell unconscious and Harjit Singh escaped. 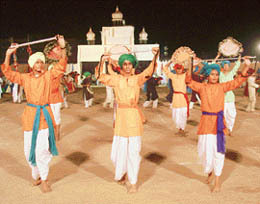 Harjit Singh began living with Krishan in Mahmoodpur. Police officials said in 1990 when Harjit Singh was involved in militancy, he used to stay with Lakhwant Singh in Badhoula in Ambala. He had come to meet Ram Singh three days ago to collect money. He had stayed with Ram Singh. He had taken Rs 3,000 from Ram Singh yesterday. A case was registered against him on November 25, 1993, at Kurali. Another case was registered on March 27, 1995, in Sangrur. Three cases were registered against him in Ambala City in 1991. The cases in Ambala City were registered on December 30, July 12 and November 2. A case was registered against him in Gannaur on March 10, 1995, while a case was registered in Banur on July 19, 1991. Two cases were registered against Harjit Singh in Ambala Sadar. The first case was registered on October 1, 1991, while the second case was registered on February 27, 2002. A case was registered against Harjit Singh in Rajpura on May 12, 2002, and a case was also registered in Panchkula on April 28, 2002. YAMUNANAGAR: Due to mismanagement of Haryana Power Generation Corporation Limited, the power position in Haryana has worsened. According to highly placed sources the Power House No 4 of Hydel Project was to be completed by March 25, 2004, but till date the goal has not been achieved by the department. It is gathered that three power houses of Western Yamuna Canal, Hydro electric Project at Bhudkalan in Yamunanagar district which was generating 48 mw of generation per day have stopped the generation for the past one month because the fourth power house is under construction and moreover, the maintenance work of three power houses were undertaken. The new power house will generate 14.4 mw of power daily. Machines for the fourth power house which were imported from Japan in 1980 were purchased by Haryana Power Generation Corporation Limited. It is learnt that eight machines costing Rs 20 crore were purchased out of which six machines were commissioned, but the two machines for Power House-4 were lying idle in go-down in hydel stores. It is learnt that even the insurance departments initially refused the Hydel Department to insure the power house-IV because they felt that machines were too old and they were unable to cover it. The department had earlier claimed that they would inaugurate the fourth power house in a stipulated time. It is gathered that commissioning of the fourth power house was undertaken on Friday evening and power house was under trial initially. The machine has been rolled successfully, which is under observation for taking the technical parameter and likely to generate the power and feed into grid within a day or so. As the election process is on and so also the harvesting season, farmers need more power. Similarly, exams of various classes are also being held. When this newsman contacted senior officials of the department, they confirmed that the situation was under control and that trials had been undertaken. They assured that the fourth power house would be dedicated to the people of Haryana within this month, which would ease the power situation in Haryana. The officials revealed that the National Insurance Company had given them a policy covering the risk of fire and flood and a premium of Rs 2.5 lakh had been paid to them. They stated that insurance departments refused to cover the erection, testing and commissioning probably because the machines were too old. The officials stated that power generated by Haryana Power Generation Corporation Limited was much cheaper than the power from thermal plants. The operational cost of power was 18 paise per unit because running of water of the Yamuna was available. The officials informed that two machines for Power House 4 of 7.2 mw each would be installed. There is only one hydel project in Haryana whereas the neighbouring states like Uttar Pradesh, Uttranchal, Himachal Pradesh did not lag behind and has maximum use of running water. In Uttar Pradesh there are 15 hydel projects. The official informed that the Haryana Government was also thinking of having a small and mini hydel project of 2 mw at Dadupur Headworks near Yamunanagar district. It is further learnt that cost of the power 4 is about Rs 70 crore, whereas Rs 56 crore have been funded by the Power Financial Corporation and a balance of Rs 14 crore has been arranged by the Government of Haryana. On the other side much-awaited Yamunanagar Thermal Power Plant is hanging fire. It is learnt that now environment studies are going on. A team from Ranchi had already arrived at the site of work and conducting the necessary studies, which will take about three months to complete the job. A woman, Raj, of Mangala village in the district has lodged a complaint with the police accusing her second husband of beating her 7-year-old handicapped daughter to death. On the basis of the complaint the police dug out the body of the child. A post-mortem was performed, which confirmed death due to a blow on the head. The police after getting the post-mortem report registered a case under Section 302 of the IPC against the husband of Raj. The district police chief, Ms Mamta Singh, today confirmed the incident. She said the police received a complaint from Raj of Mangala village. In her complaint Raj stated that she had a daughter from her first marriage with Chiman Lal of Hajrava village. When Chiman Lal died five years after their marriage, she was remarried to Mohinder Singh of Patli Dabar village in the district. She said Mohinder Singh allegedly mercilessly beat her handicapped daughter to death and buried the body in the village cremation ground. After receiving the complaint, the police approached the Deputy Commissioner for orders to get the body of the child exhumed. In the presence of the Magistrate deputed by the Deputy Commissioner, the police dug out the body and sent it to the local civil hospital for post-mortem. 24-year-old Mehar Singh was posted at Kupwara and died in an operation against terrorists. Over 100 persons, including Mr Vijayendra Kumar, Deputy Commissioner, Mr Rajender Singh, SP and Mr Banta Ram, MLA (Radaur) attended the funeral. Mr Nirmal Singh Saini, father and Mrs Bimla Devi, mother of the martyr, said they were proud of their son. The Deputy Commissioner announced a grant of Rs 25,000 from the Red Cross for the martyr’s family. Two persons, including a travelling ticket examiner (TTE) received bullet injuries when a youth allegedly travelling without ticket fired at them with a country-made pistol in a train (45PR Jind to Rohtak) here yesterday. The two injured were admitted to the civil hospital here. The incident took place, when TTE Balwant Singh, asked the youth for his ticket. The youth who allegedly was travelling without a ticket shot at the TTE when the train passing through Matloda town 15 km from the city. Lilu Ram, sitting next to the youth also received injuries in the incident. The condition of Lilu Ram was said to be critical as he had received injuries on his head. The youth escaped. Haryana Janata Dal (United) President Ved Prakash Vidrohi today resigned from the party here today citing displeasure with the policies of its leader George Fernandes. Mr Vidrohi told reporters that the JD(U) which was a constituent of the NDA was ignoring core issues concerning the nation and was siding with the BJP in unnecessarily diverting voters’ attention by raking up the Bofors issue and demanding a CBI probe against Congress President Sonia Gandhi. The police has arrested two persons in connection with the murder of Krishan Pehalwan, a former president of the students union of the local RKSD College, here last month. Both accused were produced in a local court, which remanded them in judicial custody yesterday. The SP, Mr Sukhdev Singh, said those arrested were Joginder Singh, a resident of Geong, and Devi Lal of Narar. These two had given shelter to the two main accused Surinder Singh of Geong and Balwant Singh of Patti Afgan here. The police continued to raid possible hideouts of the main accused in Punjab, Delhi, UP and Haryana to arrest them, he added. Krishan Pehalwan was shot dead by the motorcycle-borne youths outside the local bus stand on March 12 last. The Additional District and Sessions Judge, Mr Manjeet Singh here has sentenced two persons to 10 years rigorous imprisonment and fined them Rs 1 lakh each after convicting them under the NDPS Act . The convicts will have to undergo further imprisonment for two years each if they fail to pay the fine. The third accused was acquitted by the court. The police on August 22, 2000, had stopped a four-wheeler at a naka near Bhagal village. On search the police seized 32 bags of poppy husk concealed under the maize bags . Following this, the police arrested Rama Ram of Kalan Mazra , Parkash and driver Sharif Ahmed of Saharan Pur and booked them under the NDPS Act. Five persons were sentenced to life imprisonment and a fine of Rs 6,000 each was imposed on them by the Additional Sessions Judge, Mr R.S. Bagri, in a double murder case. According to information today, a case was registered on the complaint of Jagdev Singh in 2000. He had alleged that Gurdeep Singh, Tota Singh, Jagdev Singh, Bharat Singh and Hansraj of the village had shot his uncles Butta Singh and Makhan Singh of Ghukkanwli village. He himself had sustained injuries. The reason behind the incident said to be a water dispute. The police had booked them under Section 302, IPC, in the double murder case.